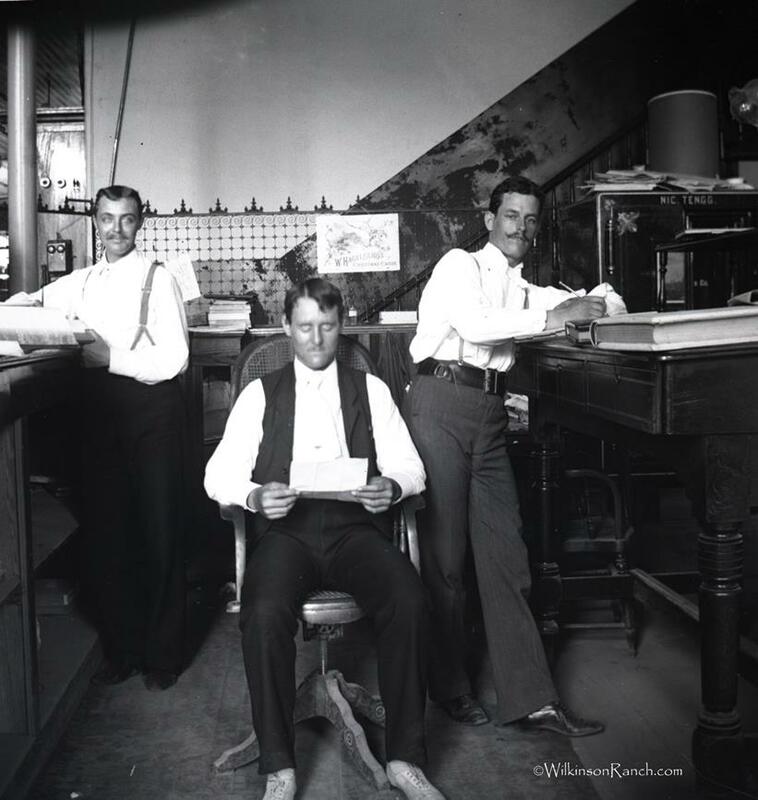 tags: "glass negative", "Nic Tengg"
Nic Tengg started his business in San Antonio in 1874. Here is one of my glass-plate negative photos and you can see a safe behind the stand-up desk with the name Nic Tengg. Wonder who took this photo, when and where this is located? Could any of these men be one of the five sons of Nic Tengg? You can click the map and go to a larger photo. I found the two below photos on Flickr and the invoices for Nic Tengg with 218 West Commerce Street, San Antonio, Texas. In my research for the date of my glass-plate negative photo of the Alamo; (http://blog.wilkinsonranch.com/2011/09/23/my-research-and-images-of-the-history-of-the-alamo/) it shows that the named business; Nic Tengg was located for over a half century on the south side of West Commerce, just east of Oppenheimer Bank in what was originally called “The Old Curiosity Shop” by Julius Berends. Nic bought this business in 1874. Nicolaus Tengg was born in Austria on 6 December 1847, son of Eva Meyer and Thomas Tengg, both born in Austria. His family moved to San Antonio in 1852 by way of Indianola. He went to German-English school and then to St. Mary’s College. He worked for Julius Berends, a bookseller and stationer whose business was established in 1854. It was San Antonio’s first book store which he called “The Old Curiosity Shop”. Berends was very successful and his store was a gathering place for German intellectuals. Berends and his friends organized the Krankenkassen Verein, the Casino Society, and the German-English School, for which he served as director for 15 years. The building still stands today as a reminder of the high educational standards of those early German immigrants. It was built by Johann Kampmann. In 1874, Berends returned to Germany and Nic bought his business and Nic Tengg’s bookstore became an institution in downtown San Antonio and remained a family enterprise throughout its ninety-year existence, eventually involving several of Nic Tengg’s sons. He was a bookseller, stationer and printer also map maker. The business was located on the same block for over a half century on the south side of West Commerce, just east of Oppenheimer Bank. At one time Nic served as Secretary of the old German-English school established by Berends and other members of the immigrant community. He was first secretary of San Antonio’s Turnverein. On July 19, 1927, Nic Tengg , widower, died from a cold that developed into bronchitis at his home on 326 East Crockett Street. He was buried on 21 July 1927, in a family plot in the City Cemetery No. 1, at the far west end. He married Louise Plumzer on 27 August 1866, she was a member of a German-immigrant family. They had 9 children, 5 sons and 4 daughters. Their eldest son was named Julius (1867-1966) in honor of Julius Berends. The Nic Tengg business was closed by the family in 1964. Some of this information came from the personal files of Mary El-Beheri, Julius Berends’ biographer. An undivided back card with a black and white view of Alamo Plaza, San Antonio, Texas. The Alamo itself can be seen to the right. In the middle of the shot is the Hugo Schmeltzer Building, with the Post Office behind it. Nice details. The image is marked “7 Nic Tengg” in the lower right corner. There is no further publishing information. This card was sent from San Antonio to East Saint Louis, IL in 1903. This is in my personal collection; postcard by Nic Tengg. A photo of the San Antonio post office from a viewbook published by bookseller Nic Tengg in 1907. Known as souvenir viewbooks, albums like this were published from the late 19th through early 20th centuries. For tourists who didn’t have cameras, they provided an elegant alternative to carrying home a sheaf of postcards. The publisher of your book was Austrian-born local bookseller/stationer Nic Tengg (1847-1927), who also published postcards and maps, printed brochures and letterhead stationery, and sold other paper goods and books in his shop at 220 W. Commerce St. Your book, according to comparisons with similar volumes in local libraries, is one of many different versions Tengg published. The San Antonio Conservation Society has the 1905 edition, which does not include an introduction. The Texana/Genealogy Room at the central San Antonio Public Library also has a copy, cataloged as “San Antonio,” by Nic Tengg, published in 1907 by Tengg. Texana Manager Frank Faulkner saw your copy and says it’s from the 1907 edition, which has the introduction you quote. Both your book and Texana’s have green paper covers, about the weight of construction paper; both fasten on the left side with a string threaded through holes punched in the paper. “However, the ‘San Antonio’ (title) on a good copy is indented with white paint in the letters,” says Faulkner. The white coloring is missing from your copy, as are two of the 23 pictures. At the DRT Library, archivist Caitlin Donnelly and librarian Martha Utterback would like to see your copy, which sounds similar to the “San Antonio Album,” an undated book in the library’s collection that seems to match your book in some respects. The sequence of photos in both books is similar, although the Album doesn’t have an introduction and has hard, red covers. Another book there, “Picturesque San Antonio Texas,” has paper covers like yours, but its photo of the post office is not labeled in the lower right-hand corner as yours is. Donnelly suggests you visit the library on the Alamo grounds to compare the two books and to pick up a copy of the DRT Library’s list of appraisers. This list does not constitute any endorsement by the DRT, but could help you get started on finding the value of your book. You may also stop by the History Shop, 713 E. Houston St., where Jim Guimarin has handled San Antonio photo books at prices ranging from $25 to $400. “Normally, anything less than original makes it half or more (of the possible top value),” he says. At the time of this writing, a Washington, D.C., bookseller was offering a copy of “Picturesque San Antonio, Texas, Photo-Gravures,” published in 1904 by Tengg, with “original green wrappers (faded and soiled), ties lacking, spine very worn,” for $165 at Advanced Book Exchange, www.abebooks.com. E-mail questions to Paula Allen at history [email protected] Follow her on Twitter at twitter.com/sahistorycolumn.